The Bay Area has seen an explosion of young bands that play music with an eye toward finding new rearrangements of rock's early influences. 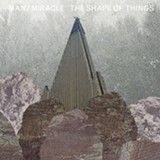 Part of the scene is Man/Miracle, whose sound incorporates jam band, world-music rhythms, melodic pop choruses, raw-edged roadhouse rock, and plenty of loud guitar. The band's debut record, The Shape of Things, is built around Dylan Travis' jittery guitar-playing and drummer Tyler Corelitz's nimble, varied rhythms. It works on the record, but this is music meant to be enjoyed live. For recording, production and mixing, the band turned to Eli Crews (WHY?, Deerhoof, Beulah), who clearly understands how to guide a band through shifting styles while keeping the rough edges intact. The strong second half features the riveting "Pushing and Shoving," with catchy riffs and boundless vigor, before calming down for "Other People," a slinky, bass-driven song that leans back to Brit-pop roots. Man/Miracle might suffer from a lack of focus and vocals that are more yelps and howls than actual words, but that hardly seems to be the point. There's a wave of good energy, and at about thirty minutes, the album leaves you wanting just a bit more.